Sierra Leone is to enforce a three-day lockdown of key parts of the country to try to contain the Ebola epidemic. 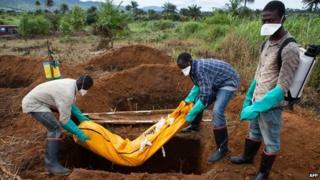 There have been 3,702 reported deaths from Ebola in the West African nation. A three-day curfew in September, keeping people at home under quarantine, was hailed as a success by authorities, despite some criticism. The country's National Ebola Response Centre says a new lockdown will come into place next week. It will affect close to 2.5m people. While the number of cases has slowed since the peak of the outbreak, the virus is far from eradicated. In the seven days leading up to March 15, there were 55 new cases in Sierra Leone, and 90 in neighbouring Guinea. The number of new cases in Liberia - where most deaths have occurred - has not been registered. Palo Conteh, the head of the NERC, told the AFP news agency that the curfew would take place across the Western Area of Sierra Leone, a part of the country that includes the capital, Freetown. The districts of Bombali and Port Loko will also be affected. "The lockdown will be conducted from March 27 to March 29 and will be like the one we conducted in September last year," said Mr Conteh. "The government and partners are hopeful that latent cases that are now not being reported or recorded will come out." Mr Conteh said that health workers will visit every house in the areas affected by the lockdown. They will remind people about the dangers of touching corpses and taking patients to traditional healers. Liberia's government is to pay $5,000 (£3,391) to the families of each of the 179 health workers who died from the virus there. There have been 10,216 deaths due to Ebola, according to the World Health Organization. The majority of those deaths have been in three West African countries - Liberia, Guinea and Sierra Leone. The economic effect of the outbreak has been severe in Sierra Leone. The World Bank estimates that the revenue of some parts of the population has dropped by as much as 40%, and that close to 180,000 people have lost work as a result of the crisis. Despite dozens of new cases every week, the government is determined to meet a target to eradicate Ebola by 15 April.